Even as Ragnar Lothbrok’s plan to raid Paris proceeds with characteristic dispatch, the episode “Paris” sees Vikings losing its mission. Worryingly for a series whose singular storytelling focus has always been one of its mains strengths, the episode continues to dilute the narrative by introducing even more ancillary, non-Viking characters, and then getting lost, meandering through side-stories set in European courts whose intrigues seem wan and stale next to Vikings’ regulars. 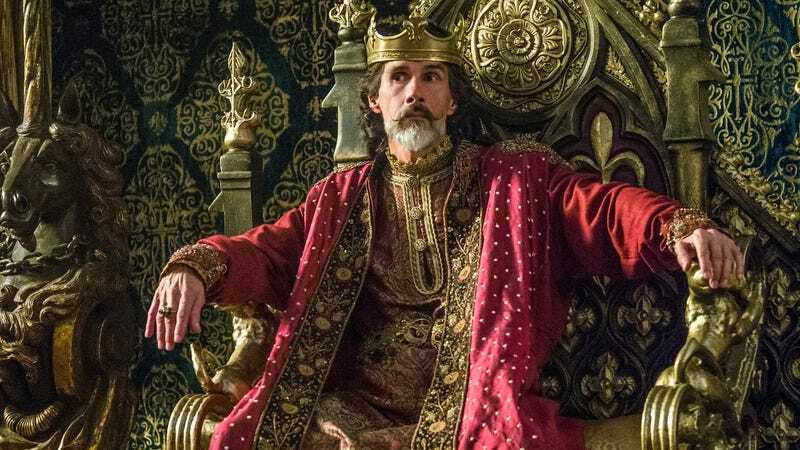 Honestly, “Paris” makes it seem like creator Michael Hirst is looking back—not to the evocative time and culture of the Norsemen, but to his previous shows. Apart from the appearance here of Lothaire Bluteau (as Emperor Charles of France, a.k.a. Charles the Bald), late of Hirst’s The Tudors, fully half of the episode is taken up with palace drama, both in Paris and back in Wessex. Even if these sequences were more compelling than they are, they’d still signal a distressing detour from Vikings’ usual propulsive storytelling style. Take the Vikings’ story tonight—Ragnar and his allies are camped out in sight of Paris, preparing to attack the city. At the end of the last episode, they hadn’t yet left Kattegat, Athelstan was freshly murdered by Floki (although no one knows that), and Ragnar’s fractious alliance with the untrustworthy Kalf and the clearly resentful and vengeful Erlendur was just introduced. In “Paris,” without reference to what has happened in the interim, the Vikings are together, already at Paris’ gates, and, as an audience, we’re left on our own to put the pieces together. I’ve said it before, but such narrative briskness is exhilarating—and a welcome departure from more traditionally leaden television storytelling, where every detail must be put to bed before a new one is introduced. On a character level, it makes sense, as the main characters (and Ragnar especially) are not prone either to dwell on the past or to give vent to their feelings about it, a relationship between character and narrative that makes Vikings’ unique, and exciting. For example, here, Ragnar’s suspicions about Floki and Athelstan (and his grief over the murder of his friend) are read in their every interaction, but spoken of only in coded language and glance. It makes the opening staring contest between the two and their subsequent actions—as Ragnar puts Floki in charge of the raid on Paris—bristle with energy. It’s a boon to Travis Fimmel and Gustaf Skarsgård, their usual magnetic performances given an added frisson of unspoken conflict. Unfortunately, so little time is spent in the Vikings’ encampment that we’re left to grab snatches of the story we care about from between two lumbering, overstuffed storylines we do not. Floki’s new role as secret betrayer and murderer brings tantalizing hints of energy to the character—his old impish giggle is back, especially once Ragnar’s seeming trust in naming him leader of the raid makes him feel valued again. With Athelstan dead at his hand and Ragnar entrusting him not only with leadership but also with devising a way for the Vikings to scale Paris’ “impregnable” walls, he is, once again, the manic, giddy Floki of old. As he gleefully confides in a horrified Helga (while gripping her face painfully in his enthusiasm), he truly believes what he’s done has saved Ragnar from the Christian influence Floki has always loathed and feared, and has also made things right again with the gods. Scampering over the rigging he’s constructed, his eyes flashing with invention and frightening surety, Floki thinks he has eradicated Athelstan’s influence completely and that things are just as they were. What he can’t see is that Ragnar’s vision for the Norse involves things changing irrevocably, and that anyone as fanatically devoted to the old ways as Floki is will have no place in Ragnar’s future. The coming Ragnar/Floki conflict is inevitable, and no doubt terrible, but, in the best parts of “Paris,” only Ragnar’s enigmatic actions and glances hint at its coming. That’s the good news. What’s far less promising is Hirst abandoning such storytelling ambiguity to plod through two separate (but equally dull) stories of kings not named Ragnar Lothbrok. Again, it’s like the introduction of European court intrigue has breached Vikings shield wall and allowed Hirst’s The Tudors and The Borgias to sneak in. It’s necessary to introduce the Paris players at this point, but the three main characters therein are sketched out so perfunctorily that the actors are helpless against it. Emperor Charles is the weak leader, Bluteau seemingly taking his cue for French kingship from Paul Scofield’s velvety weariness in Branagh’s Henry V. (Although for some reason, I kept flashing on Peter Ustinov’s whimpering Prince John in Disney’s Robin Hood as well.) His daughter Gisla (Morgane Polanski, daughter of Roman) is the strong one, urging him not to flee the city but prove himself equal to his illustrious grandfather Charlemagne by standing alongside Owen Roe’s Count Odo and driving off the invaders. Oh, and Odo has always wanted to marry Gisla, a topic about which they converse at some length. Add to that that the Paris scenes look cramped and stagebound, especially during an overly extended sequence of Gisla slowly walking to prayer, and “Paris”‘ energy level plummets every time the action shifts back to Paris. And Wessex is even worse. Despite Linus Roache’s entertaining villainy—becoming even more arch tonight as he puts the moves on poor Judith with the help of a Roman version of “To The Virgins, To Make Much Of Time”—there is simply no need for the show to spend this much time back in England. The settlers are all dead, which is relevant in that Ragnar will have to deal with Ecbert’s treachery in the future, but we already know that. If ever a plot called for some signature Vikings “we’ll catch up with that later” storytelling, it’s the doings in Wessex. Instead, not only does “Paris” spend fully a third of its running time in England, it doubles down, building up the thoroughly uninteresting character of Moe Dunford’s Aethelwulf to bewilderingly little purpose. Vikings’ has a lot of things going for it that set it apart from both Hirst’s previous forays into period drama, and period drama in general, but its focus on a culture so fundamentally different from the usual European court milieu is central to its appeal. Sandwiching that world between two very stale and deadeningly familiar storylines turns Vikings into colorful background in a far less interesting show. Even the Viking world isn’t immune to flat stories, however, with Bjorn’s dalliance with Torvi vying with Porunn’s brief scene with Aslaug as most unnecessary. Once again, Bjorn’s tale wins, as his gift to Torvi spurs immediate, sneering abuse from the Joffrey-like Erlendur. Poor Porunn’s brief scene, with her wanting to give baby Siggy over to Aslaug to raise “as a Viking” at least allows she and Aslaug—two women left behind—to commiserate about their shared fate. Aslaug’s “We women bear heavy burdens but it is not to be helped. And even when we are dealt with harshly remember, it is the gods who have woven our destinies, not ourselves” is more introspection than we’ve seen from her in a while. Floki’s dismissive “bup bup bup” is just the sort of treatment the interrupting Kalf deserves. Judith is rocking a lovely, flowing side pony tail to cover her amputated ear. 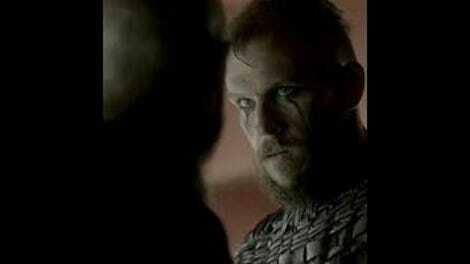 Floki’s pronouncement to Helga, “We will all gain the greatest renown, especially me!” puts him, like Kalf (and Charles tonight) at odds with Ragnar’s speech to Bjorn about the purpose of power from the beginning of the season. The final scene of Floki unveiling the floating siege towers he’s built while the Viking forces mass, chanting, behind him is another stunning scene where the essential otherness of the Norsemen becomes something chilling. Leading the chants of “Axe time Sword time! Shields are splintered!” with signature, unknowable fire in his eyes, Floki remains the implacable heart of all that is Viking. Which does not bode well for Paris.